VMware Front Experience: The VMware Tools GUI is gone - Now what? What could you do with the old GUI? So are all these options no longer available? There is also a detailed manual available in PDF format. The stat option is something that was not exposed in the GUI and is only available with the CLI tool - on ESX(i) hosts it reveals some interesting information about e.g. the host's CPU speed and possible memory and CPU reservations. Why was the GUI removed? I haven't found a VMware official statement that answers this question. In KB2046615 it is just stated that this behaviour is intentional. So we can only speculate about the reasons: For me the most probable reason is that VMware does no longer want to provide an easily accessible and usable GUI to every Windows Server Administrator (or even Workstation or Terminal Server user) that s/he could use to make changes to the virtual hardware of the machine - maybe just unintentionally and/or not really knowing the consequences. In larger companies not every Windows administrator is also a VMware administrator, so it may make sense here to hide the functionality of the VMware Tools, resp. make it only available through a "hidden" CLI tool. Is there any way to bring the old GUI back? Yes, the most obvious way is to continue using the VMware Tools of ESXi 5.0 (resp. VMware Workstation 8) even on newer versions of ESXi and Workstation, because these older versions still have the GUI available. You can then launch the GUI by double clicking the cpl file (that is a Control Panel applet). On Windows systems that use UAC (User Account Control) you need to run the exe file instead - it will then prompt for elevation and start the cpl file in turn. 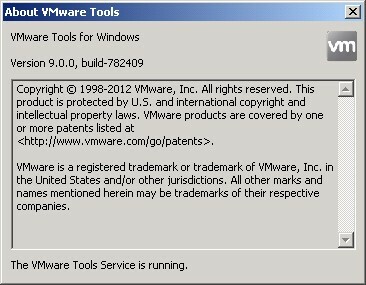 Of course this is unsupported by VMware, but as far as I could test it, it works fine. I think it's not about providing false security, but more about preventing inexperienced Windows admins from making unintentional changes to a VM. Preventing inexperienced user to make unintentional change? This is a false sens of security. If you want to prevent that, use account right and security level. Any inexperienced user can google what he want to do and find a way to do it anyway and can end up doing more damage.